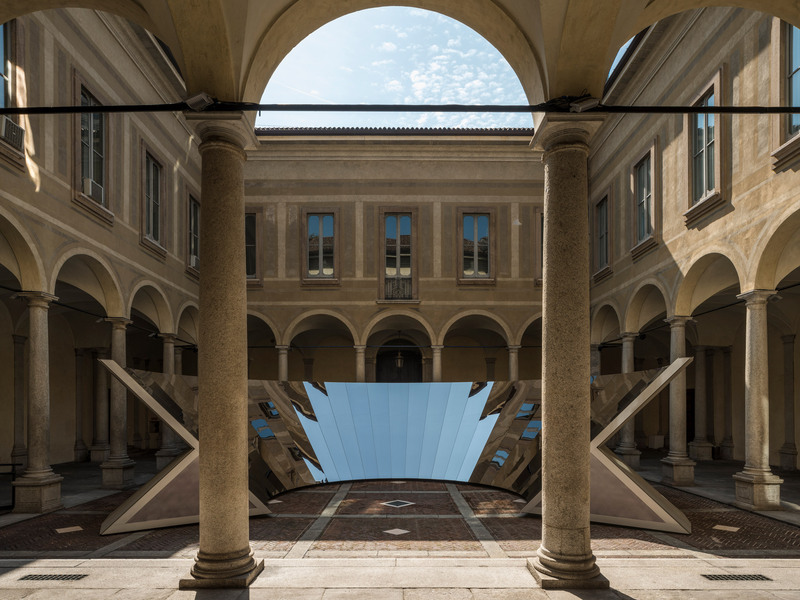 American artist Phillip K Smith III has worked with fashion brand COS to install a faceted mirror structure in the courtyard of a 16th-century palazzo, as part of Milan design week 2018. Smith is the latest in a series of designers to create a Milan design week offering for COS, following Studio Swine and Sou Fujimoto. 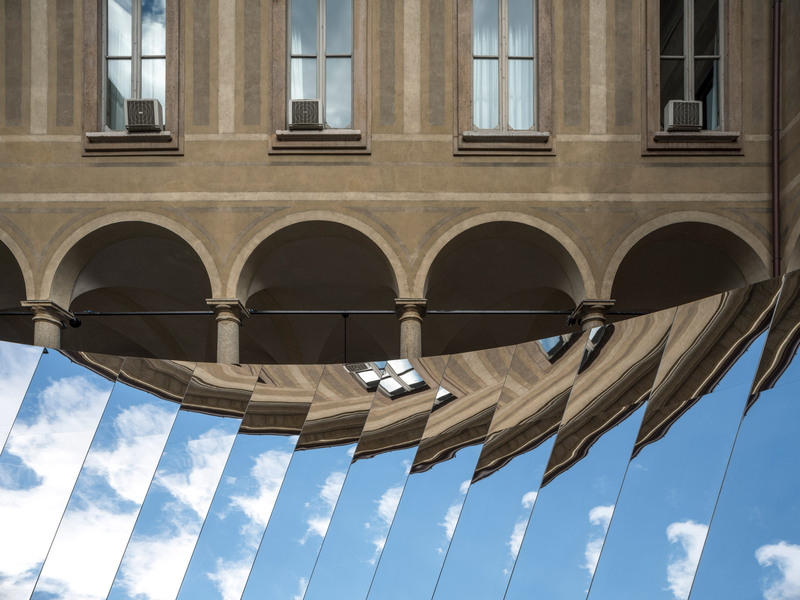 His Open Sky installation, on show from 17 to 22 April 2017, sees a faceted wall of mirrors set in the courtyard of Palazzo Isimbardi. The designer said he was given a relatively open brief by COS, but it was the location that ended up influencing his design. "I was given the brief of 'we like your work, here's the site, we'll talk to you in a month'," Smith told Dezeen. "It was a carte blanche and an opportunity to think totally freely." 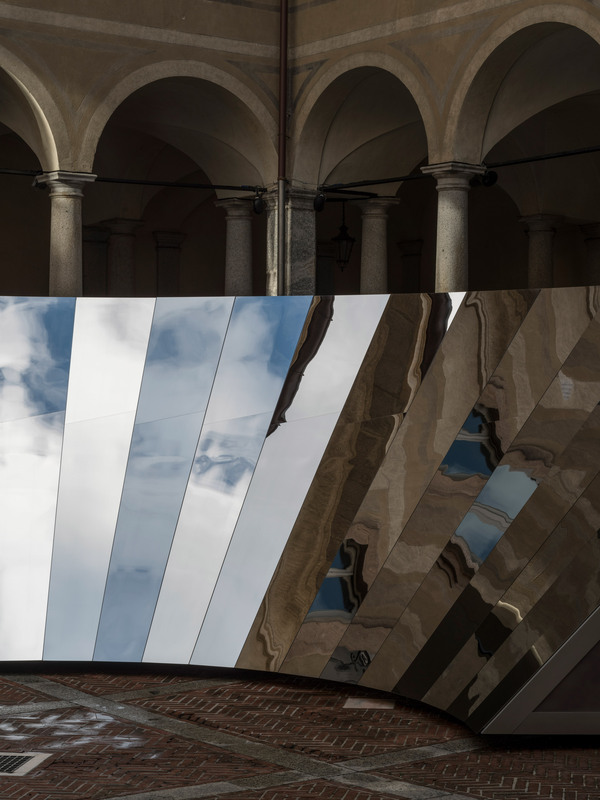 Smith used huge plates of mirror-polish stainless steel – a material often found in the designer's work – in a bid to "pull the sky down to the floor". He said his aim was to create a moment of calm away from the busy streets, while also encouraging the public to interact with the surrounding architecture in a more intimate way. "The piece is inspired very much by that site. It's a circular, faceted, conical installation that merges the Milanese sky with renascence architecture," he said. 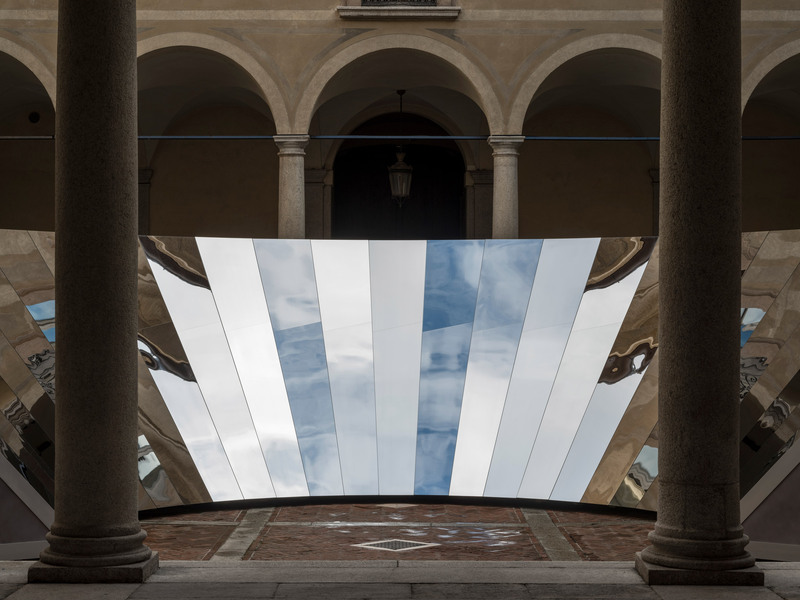 "The square of sky above the courtyard transforms into a semi-circular form, that sits on the courtyard floor directly in front of the viewer. The idea was to actively and seamlessly merge the beauty of the surrounding architecture and the sky over Milan, creating an ever-changing experience," he added. Visitors are first met with the Open Sky installation as they enter into the courtyard. 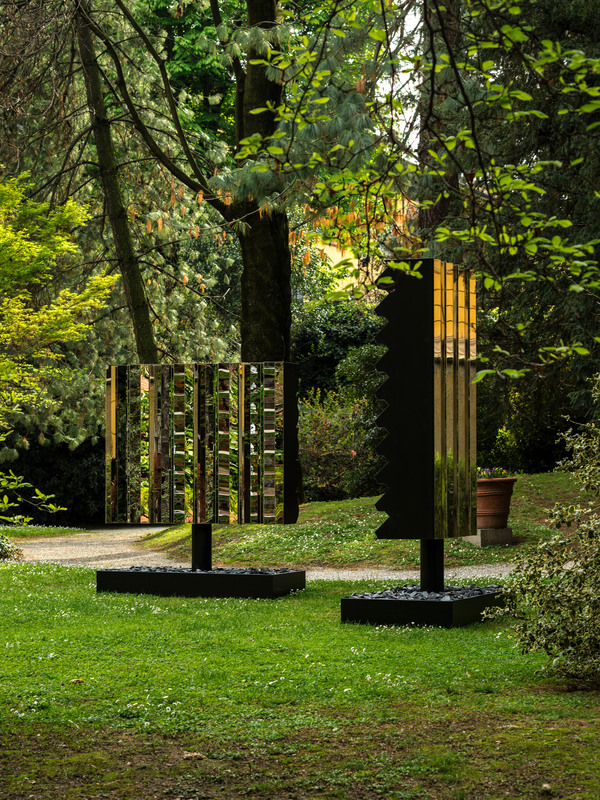 Walking through into the garden beyond, they see a further group of smaller-scale mirrored pieces, designed to interact with their surroundings in a similar way. The artist has also worked alongside COS to create works for the windows of its Milan stores. Smith was born in Palm Springs, where he now runs his studio. He often uses expansive and arid landscapes as the backdrop his mirror installations – past examples include a cabin wrapped in reflective bands and a circle of mirrored sticks. "His approach feels much aligned with our own ethos of creating subtle, considered design at COS," said Karin Gustafsson, creative director of COS.
"It is from these experiences of art that our perceptions are shaped, and it’s why we are so pleased to partner with Phillip this year." 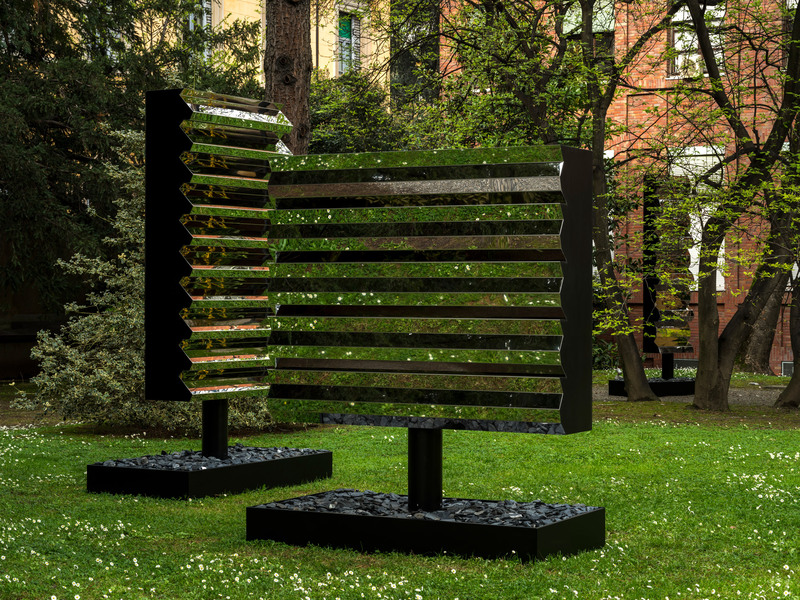 Open Sky will be on show at Palazzo Isimbardi for the duration of this year's Milan design week, from 17 to 22 April 2018. Previous COS installations include Studio Swine's sculptural tree, which blossomed with mist-filled bubbles, and Sou Fujimoto's "shifting forest of light".